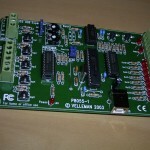 I finaly figured out how to compile and run the library and gui program for the Velleman k8055 board on Ubuntu Linux. First I downloaded this: libk8055. Next: I downloaded the gui program: k8055gui. I’ll try to find a way so you don’t need to be root to execute the gui program. I bought and assembled this Velleman K8055 kit (quite) a while ago. It’s an USB experiment board. Under windows it all works quite nicely; but under Linux I have been unable to compile the demo program. The demo program consists of two parts: a library called libk8055 and the Linux clone of the Velleman demo interface. I’ll try again later, when I find the courage to dive deeper into the sources. I’ll also try to get the bugfixes upstream once I finalise them.